Tom and I spoke on the phone in June of 2008 and came to an agreement whereby he would build me a canoe, and that I would spend as much time up north with him helping. I wanted to learn as much as I could, and also wanted to know enough to be able to maintain and repair the canoe - especially when out in the wild. Adney, Edwin Tappan & Chapelle, Howard, I. (1964). The Bark and Skin Boats of North America. Washington: Smithsonian Institution. Having made these decisions, the only thing left was for Tom to head out in the bush and start collecting materials - in perhaps the worst mosquito season in memory. The canoe, which was started around the end of July 2008, and finished in early October, is shown in the photo below. At least Insofar as I was able to do so on my three trips up to Northern Ontario to help, I tried my best to document the construction process. The results can be accessed via the links below. This canoe was also just over 17' long. As it turned out, two people had to drop out of the trip at the last minute, so it ended up being left at home. Nevertheless, the reason for the design was partially that we were going to be in Cree country, and therefore liked the idea of a design from that region. 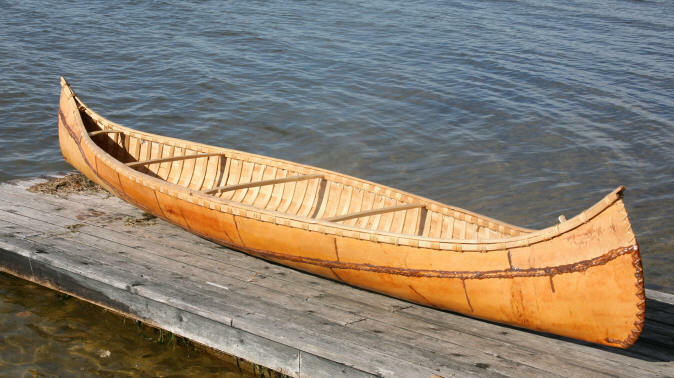 And, like the first canoe, we made it larger than the one documented in Adney & Chapelle because we wanted something that would track and manage large lakes as well as white water. The following pages document the building of the first canoe. I will add to them as as I have time. You can jump to any page by hitting the link below, or step from page to page by clicking on their "next" and "previous" links. Start of build. Introduction, bark, ribs and sheathing. Collecting and preparing roots for sewing and lashing.